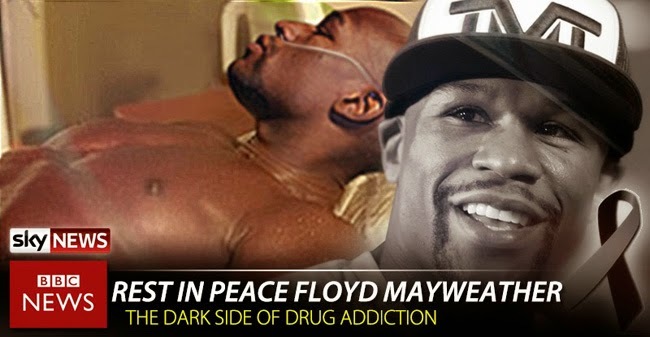 The hoax news of Floyd Mayweather’s death due to overdose had been circulated over the internet. Accompanied by a banner showing Mayweather with a nasal cannula and words saying ‘Rest In Peace’. According to Despeirta Tico, Mayweather had died because of overdose of cocaine. His body was said to be found by one of the cleaning crew. He was declared dead in Cedars Sinai Medical Center by Leonard Walker, chief in charge a few hours after his body was taken there. It also says that he was already dead when his body was rush in the hospital. The hoax news had surprised the world of boxing but it was immediately cleared that it was a hoax. Mayweather is alive and the megafight is still unsure. It was on December 13, 2014 when Mayweather Jr finally verbally agreed to fight Manny Pacquiao and even gave an exact date of the fight. He wanted to face Pacqiao on May 2, 2015, the weekend of Cinco De Mayo. He even blundered that it was Pacquiao’s side who kept on ducking the bout. When Pacqiao was asked abut his reaction when Mayweather verbally announced his willingness to do the fight, Pacman only said that Mayweather must first sign the contract. Many boxing fans shared Pacqiao’s sentiments as the agreement won’t be final unless mayweather signs an agreement. Pacquiao also shared the reasons why he wanted the megafight. He posted on Instagram that he wanted the fight to become a reality to fulfill his promise to his son and give happiness to the fans. The boxing fans all over the world had been waiting for the megafight to happen for years. Pacquiao and Mayweather will retire soon and the time seems to be running out.